Preheat oven to 180 degrees Celsius. Prepare a 20cm square baking tin by lining it with parchment paper. Melt the chocolate & butter together. You can do this in the microwave, but I prefer doing it in a heatproof bowl over simmering water. When the chocolate & butter is melted, beat it vigorously to combine the 2 well. Add the coffee powder, stir and leave to cool for 10 minutes. Add the sugar, stir well before adding the egg, bit by bit. Sift the flour and cocoa before folding it into the wet mixture. Pour into the tin and bake for 20 minutes. Be careful not to overcook – you want a bit of a squidgy centre. Cool before slicing. You can store it for up to 7 days…. which is a complete joke in our house! It doesn’t last 7 minutes!! 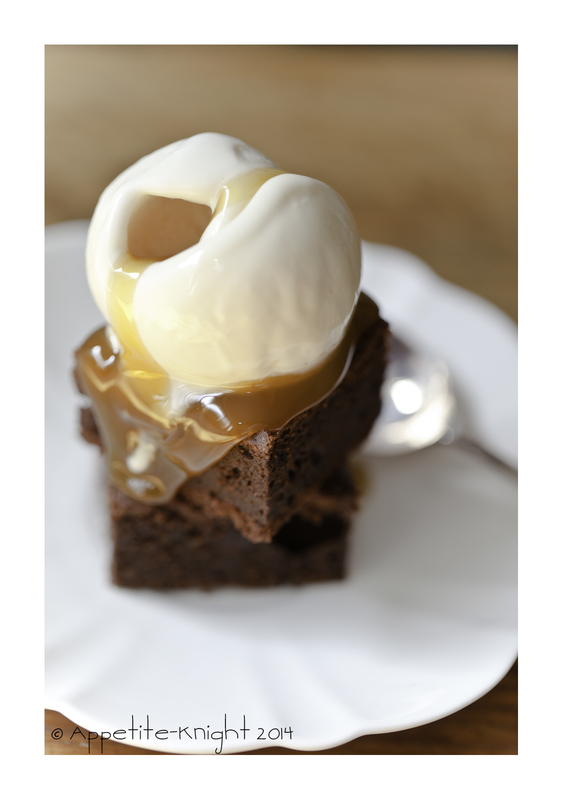 Eat on it’s own or serve warm with real vanilla ice cream & caramel sauce.